Back in 2007, Shane Lehew got an up-close look at the Forrest Wood Cup as he competed in (and won) the TBF Junior World Championship at Lake Hamilton. Hot Springs, Ark. will always be a special place for Shane Lehew. He competed in his first Forrest Wood Cup there in 2015 at Lake Ouachita, finishing 28th. 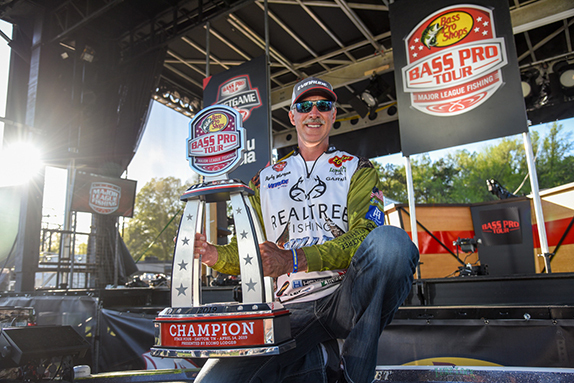 Eight years before that, he watched Scott Suggs become bass fishing�s first instant millionaire as Suggs won the Cup at Ouachita. Lehew wasn�t there as just a spectator in 2007, though. 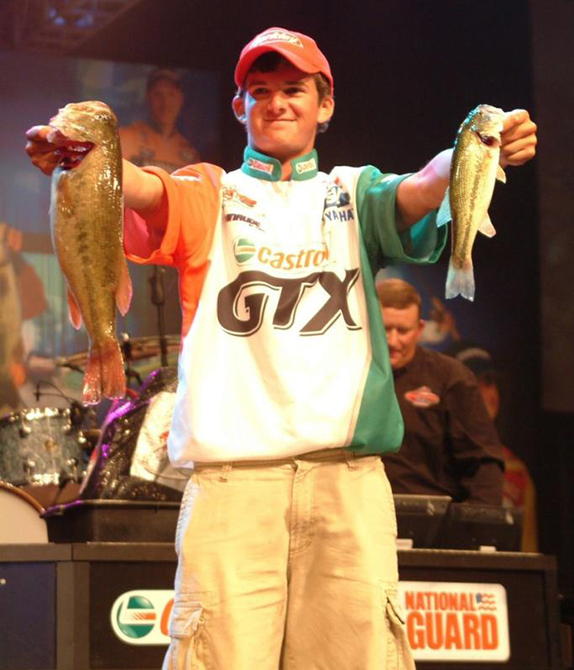 He was in Hot Springs as a competitor in the TBF Junior World Championship, which was held at Lake Hamilton, just outside the city of Hot Springs. Lehew won the 15- to 18-year-old age bracket and while his prize package wasn�t as substantial as Suggs� (he won a $5,000 scholarship grant and an array of fishing gear), he still remembers the experience fondly. �I�ll always have that memory here,� Lehew said this week as he prepares for his fourth Cup as a pro. Lehew was 18 at the time and recalled getting to rub elbows with some of his fishing heroes. Then he mentioned how seeing Suggs score a seven-figure payday influenced him to continue to pursue his fishing passion. �Suggs ruined me by holding up that big trophy and check,� he joked. 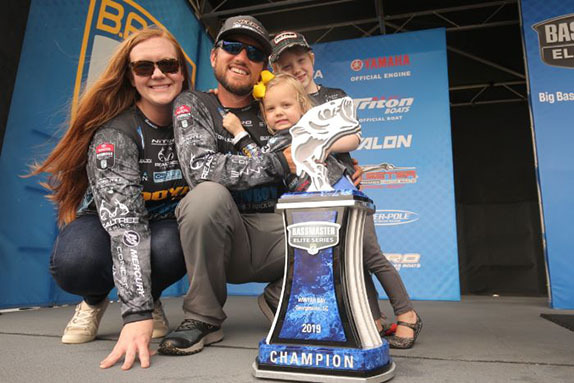 He continued on and fished in college at the University of North Carolina-Charlotte, then advanced through the co-angler ranks before moving to the pro side in 2015. Lehew remembers catching some of the winning fish in 2007 on a late model Pop-R P70 and shaky-head jig, two techniques that may come into play at Ouachita this weekend. He said Hamilton is a much different lake than Ouachita despite both being on the Ouachita River. Hamilton is heavily developed and is loaded with boat docks and seawalls. Lehew said it looks like a smaller version of Lake Norman, near where he�s from in North Carolina. This year�s TBF Junior World Championship got started today at Lake Hamilton and concludes Saturday. The final day of practice came to an abrupt end Wednesday afternoon as a storm system packing lightning and high winds roared across Lake Ouachita. As it headed toward the launch ramp at Brady Mountain Marina, a few anglers ducked into covered docks to ride it out while others high-tailed it to the nearest launch ramp and hurried to trailer their boats. Some got caught up in the storm�s wrath and their boats suffered damage as a result. Chad Grigsby's and Wes Logan's boats both suffered damage during a thunderstorm Wednesday afternoon. Chad Grigsby�s boat took the brunt of it as it got pushed sideways up onto the concrete ramp at Brady Mountain after he had left to go get his truck and trailer, which were at a different launch ramp. Wes Logan�s boat was parked next to Grigsby�s and the wave action and wind pushed Logan�s boat up against Grigsby�s and eventually got partially wedged under it, breaking the handle off Logan�s throttle control handle. 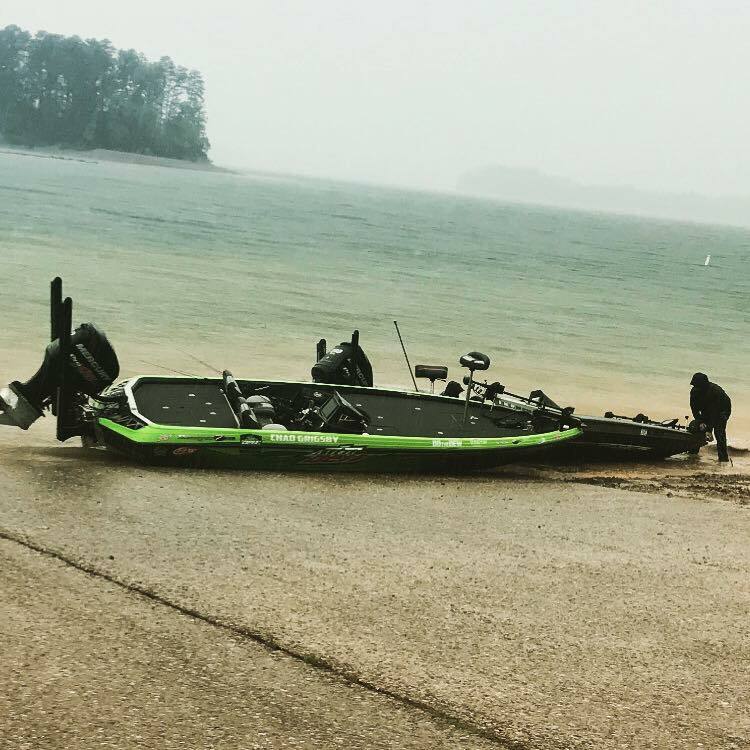 Matt Arey�s boat also suffered some fiberglass damage after it was also pushed up on shore. �It went from zero to 4-footers in like 20 minutes,� Arey said. Logan estimated the winds to be in the 50-mph range. When he returned, the damage had been done. 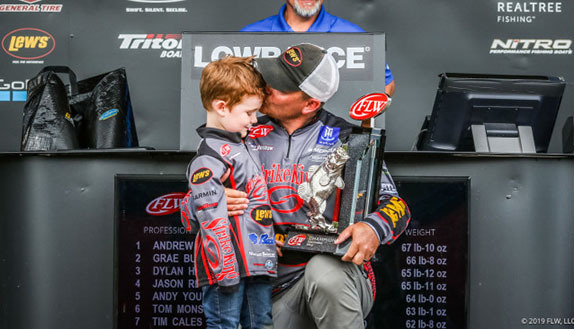 Logan and his dad, along with Arey, Grigsby and Jason Lambert, helped get the boats untangled and back in the water so they could be loaded onto their trailers. > The biggest stringer caught in the Cup at Ouachita is 19-02 by Scott Martin on day 1 in 2011. > Anglers from 19 states and three countries are competing this week. Alabama leads the way with eight competitors.